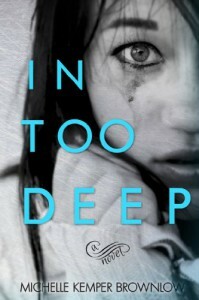 In Too Deep by Michelle Kemper Brownlow is one of those books that has caused me to lose sleep, face my demons, and forced me to realize a few things about myself. Isn't that the amazing things about books? Sometimes they can touch us on such a personal level that they change our view of things and, sometimes... make us better. I feel like I am the main character.. Like I've lived her story, because, in a way, I have. She let's this dude treat her like crap and allows him to control who she is, so much so that she doesn't even know who that is anymore. It's mental abuse, and it can stick with you, constantly making you second guess yourself and afraid to truly let anyone in for fear that you'll lose control again. Or that people couldn't possibly want to be around you because you're worth spending time with. That you owe them something for their friendship. Poor Gracie. Thank God for people like Jake, who keep her on the surface. And I'm not even finished with it yet! This book really is amazing in bringing the truth to the surface, even if it hurts. It's an up and down roller coaster ride of emotions, so far, and I'm so lucky to have come across this book. Screw therapy. Just read the right book.